I know what you're thinking -- she's a librarian; of course, B is for books. But the truth is that in an academic health sciences library, books aren't our first concern. Journals (professional-level periodicals), usually in electronic format, are much more important, are the prime source of information, and use up most of our budget. I even know some librarians who don't like to read for fun! Despite that, books are important to me. 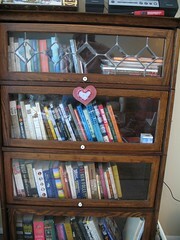 And, despite the fact that the public library has pretty much everything I need, I like owning them. I own a lot of them, in fact. 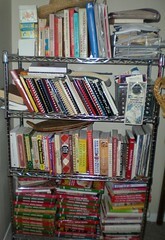 You've already seen my cookbooks. However, they're only the tip of the iceberg. 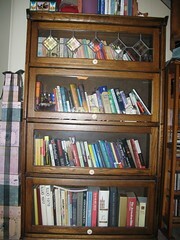 The paperbacks are shelved two rows deep. Not included here are most of my knitting books (although you can see a few of them on the top of one of the bookcases up there) and the computer and home-maintenance books. No, I don't know how many books I own. Yes, I gave a lot away when I moved (probably about 25% of my collection). 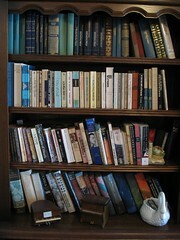 No, they aren't cataloged, although they are sort of loosely arranged by topic. 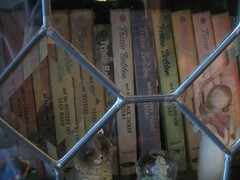 yes they are in beautiful bookcases! Trixie! When I got bored with Nancy, I turned to Trixie! I used Books for B in 2006's ABC Along. I'm guessing it would be inappropriate to do it again. I will still find a way for books to appear somewhere, I'm sure. That is a lot of books, but then who am I to judge, I have over 300 knitting books/magazines alone! And why is it that everytime I read the word librarian do I start sinking...Marianne....la la la...I don't know the words but I sure know the toon. Right here in River City. 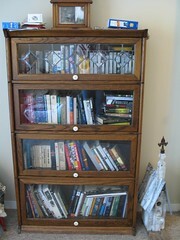 I'm so jealous of your gorgeous barrister bookcases with the leaded glass!